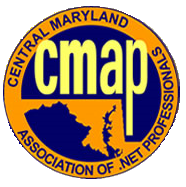 At the beginning of this month I had the pleasure of traveling down to Columbia, Maryland to address the August 2011 meeting of the Central Maryland Association of .NET Professionals (CMAP). I delivered my talk Introduction to Agile Principles, Practices, and Processes which involves no code whatsoever but focuses in on understanding the differences between Agile and Traditional approaches to managing software engineering projects. This meeting had a pretty good turn-out, with about 35-40 in attendance. Despite their being no code, it looked to me as if most everyone remained alert and engaged during the talk’s 1.5 hour delivery. I fielded some great questions from the audience (always a good indicator of people paying attention!) and we had some good discussions about some of the challenges facing Agile adoption. The CMAP user group itself was very professional in its organization and execution, complete with laptop-based electronic sign-in and thermal-printed nametags for all (including myself as the speaker). One of the things that really impressed me was the degree to which the group spent time at the beginning of the meeting announcing other area events and user group meetings – this really went a long way to helping to cement the idea of community around the meeting (“We’re all in this profession together so let’s help each other out.”). After the meeting, another 10+ of us reconvened at a local watering hole to continue the conversations – thanks for inviting me down and for having me out for drinks following; I really enjoyed the conversations and the discussions, both during and after the meeting~! The slide deck for this talk can be downloaded right here if you’re interested in seeing a copy for yourself. As part of my participation in the Telerik Insiders Program, Telerik funded my travel costs to make the drive down to the user group and deliver the talk. Telerik deserves a big thanks for their efforts in working to increase the effective reach of speakers such as myself and its been a pleasure for me to have the opportunity to visit local software development communities in larger regions than just NYC through my continued association with Telerik. Next Post: St. Louis Day of .NET–That’s a Wrap!